Police Officer Bronson Kaliloa was shot and fatally wounded at approximately 9:30 pm as he and other officers conducted a high-risk traffic stop of a wanted subject on Highway 11, in the area of Kukui Camp Road, in Mountain View. As officers approached the vehicle the wanted subject exited and opened fire with a handgun, striking Officer Bronson in the neck and leg. Other officers returned fire as the subject fled into a dense area of brush along the roadside. Officer Kaliloa was transported to a local hospital where he succumbed to his wounds shortly after midnight. The subject who murdered Officer Kaliloa was located when several associates attempted to smuggle him through a checkpoint in South Point. As a member of the agency’s Special Response Team opened the rear hatch of an SUV the subject emerged from underneath a blanket an opened fire, wounding the officer. Other members of the SRT returned fire, killing the subject and wounding one of the other subjects. All of the subjects were taken into custody and held in connection with being accomplices. 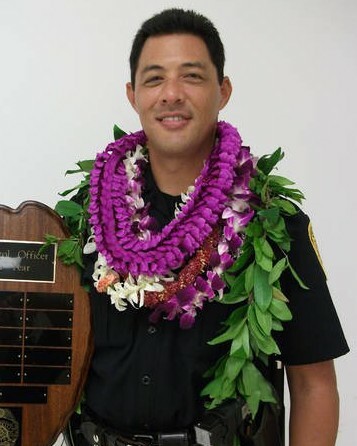 Officer Kaliloa had served with the Hawaii County Police Department for 10 years. He is survived by his wife and three young children.